Patios are a great addition to any home; not only do they allow you to enjoy the openness of the yard in a better way, but extend the indoor areas of your home too. While some people prefer the patio to be open to the air, others prefer a semi-enclosed structure. Patio planning requires skill, experience, and expertise and when you are getting this feature designed and installed, it’s important to hire professionals like the ones at LR Landscaping & Pavers for the job. Homeowners have some specific ideas about how they want their patio to be in terms of the size, styling, materials used and the theme etc. Some people may also want to get an outdoor kitchen installed on the patio as part of the project, or as an upgrade project in the future. The designers will keep all these ideas and requirements in view while providing plans. This gives the homeowners a good idea of what the final feature will look like. Patios are an extension of the indoor spaces of a home and this makes it necessary to match the design elements with the features and styling of the house. The designer will plan all the features to be installed on the patio and provide recommendations about the materials to be used. These materials will be incorporated into the design plans for final approval. The professionals will also ensure that the colors theme and overall look blends in well with the features that exist or are to be installed in the yard space. A patio is an outdoor feature and that means it has to endure climatic changes as well as regular wear and tear. This makes it important to use materials that will be tough and hardy, for this space. 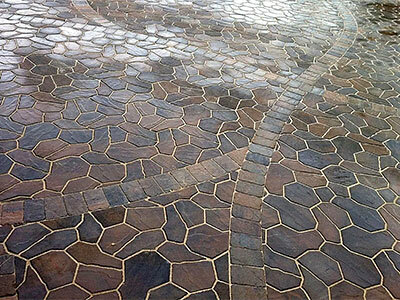 While there are a number of materials on the market that can be used for the patio floor, natural stone is probably one of the most resilient and long-lasting materials you can opt for. You can choose to get stone slabs or stone pavers installed as per your requirement. When it comes to building a patio, the designers will recommend the use of materials that will last for a long time and be tough and hardy as well. Patio blocks are an excellent option for this installation. They are able to withstand climatic changes and will provide years of service with the least amount of maintenance. These blocks could are generally made of concrete, but you can also opt for ones made of either brick or natural stone. If you are planning on getting a patio installed on your property, you want to make sure that the company you hire would be able to provide excellent, customized solutions and this is where local companies such as LR Landscaping & Pavers come in. They will provide you excellent patio design and installation solutions, at a very competitive cost.